Shane Warne produced the old magic, and Rajasthan Royals yet again defied the odds to stun Deccan Chargers and maintain their scarcely believable IPL record of always defending a 150-plus total. Even after Warne turned in career-best figures, Deccan were in control going into the final over of the match, with Rohit Sharma still there with a level-headed half-century. Their semifinal hopes reignited after the win over Rajasthan Royals, Chennai Super Kings will have revenge on mind against table-toppers Mumbai Indians when the two sides take on each other in their return match of the Indian Premier League here tomorrow. Kings XI Punjab batsman Mahela Jayawardene today said his side's eight-wicket victory over Kolkata Knight Riders in an Indian Premier League match here came at a right time to prove that there was no rift in the team contrary to speculation in a section of media. 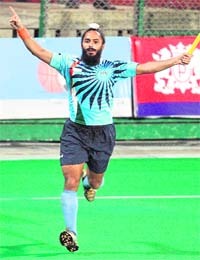 Non-inclusion of veterans Prabhjot Singh and Deepak Thakur in Sultan Azlan Shah Cup probables’ list does not mean end of their careers but the “break” will help them start afresh before the 2010 Commonwealth Games here, feels India hockey captain Rajpal Singh. “I think, they (Prabhjot and Deepak) have been given a break. They will be benefited from this and will start afresh in the future tournaments. We also have to play the events like Delhi Commonwealth Games and Asian Games in China later this year,” Rajpal said. Indian Weightlifting Federation has paid the international parent body second instalment fine of $75,000 out of $five lakhs imposed on it after six lifters flunked WADA tests last year and is fielding a 19-member team in Asian Youth and Junior Championships at Tashkent from April 7-16. Youngsters Theo Walcott and Bojan Krkic could take centre stage when Arsenal visit Barcelona in their Champions League quarter-final second leg at the Nou Camp on Tuesday. Continuing their winning spree on expected lines, hosts India thrashed Italy by 61-29 on the third day of the World Kabaddi Cup at Guru Gobind Singh Stadium here today. Mass support is the fuel that drives the success of any sport. And while in India cricket is thew biggest ‘fuel guzzler’, a day when the rural folk throng the field to watch kabaddi matches, has to find special mention. Commentary in kabaddi has come a long way and has evolved into a fine art that requires masterful oratory coupled with rustic idiom, background of the sport and strong points of both present and past players. The world is oblivious of the grappling action of titan kabaddi players taking place in various parts of the state as even after two days of the Kabaddi world cup no official website has been launched by the organisers to fulfill the need of kabaddi frenzied fans sitting across the world. Stepping up the anti doping measure, the testing of blood samples of sportspersons has been introduced first time in India. Samples of blood of 12 players, taking part in the ongoing Kabaddi World Cup, were taken here today by a team of doctors. Shane Warne produced the old magic, and Rajasthan Royals yet again defied the odds to stun Deccan Chargers and maintain their scarcely believable IPL record of always defending a 150-plus total. Even after Warne turned in career-best figures, Deccan were in control going into the final over of the match, with Rohit Sharma still there with a level-headed half-century. But Deccan bungled the simple job of getting six runs in the last six deliveries, losing their heads and three wickets to be bowled out off the penultimate ball. Earlier, Shane Watson cracked a scintillating 36-ball 58 but Rajasthan Royals suffered a middle-order batting collapse to be dismissed for 159. Watson blasted three fours and as many sixes to stand amidst the ruins, even as Michael Lumb (15), Naman Ojha (1), Yusuf pathan (5), Abhishek Jhunjhunwala (11) and Abhishek Raut (0) were dismissed cheaply after skipper Shane Warne elected to bat first. Watson played a dashing knock to anchor the Rajasthan innings but their batting capitulated as they lost first half of their side for 130 in 15.2 overs, before losing the last five wickets for just 29 runs. Rajasthan had a dramatic start after the fourth ball of the first over saw opener Lumb (15) leave the field after Ryan Harris juggled his way to finally hold on to a return catch. But to his dismay, the third umpire ruled Lumb not out as it was found that the ball had kissed the grass. Getting a life, Lumb picked up the first six of the day hitting Harris over long-off. Lumb picked up two more fours in the next over off Dwayne Smith before Harris took his catch at deep midwicket off RP Singh in the third over. One ball later, Singh struck again dismissing Naman Ojha (1) when he had him caught at cover by Harris as Rajasthan were reduced to 17 for two. Fall of wickets: 1-16, 2-17, 3-94, 4-103, 5-130, 6-130, 7-136, 8-140, 9-145, 10-159. Bowling: Harris 4-0-34-2, Smith 2.5-0-22-1, RP 4-0-17-3, Harmeet 4-0-25-2, Symonds 2-0-18-0, Ojha 3-0-37-1. Fall of wickets: 1-26, 2-47, 3-86, 4-112, 5-120, 6-137, 7-139, 8-156, 9-157. Bowling: Yusuf 2-0-3-0, Watson 3-0-40-0, Dole 4-0-42-2, M Morkel 4-0-32-0, Trivedi 2.5-0-16-3, Warne 4-0-21-4. Their semifinal hopes reignited after the win over Rajasthan Royals, Chennai Super Kings will have revenge on mind against table-toppers Mumbai Indians when the two sides take on each other in their return match of the Indian Premier League here tomorrow. With 14 points to their tally at the top of points table, Mumbai Indians are virtually assured of a semifinal berth and Sachin Tendulkar's men would, therefore, be looking to consolidate their position at the top tomorrow. 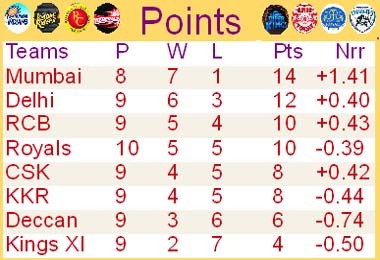 Chennai, on the other hand, need to win three more ties from the remaining five league encounters to have hopes of reaching the semifinals. 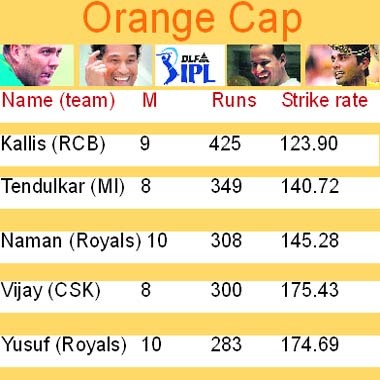 Tendulkar’s consistent batting has ensured Mumbai’s win in eight out of nine matches so far, their only loss coming against Royal Challengers Bangalore. Mumbai’s morale is high and team's confidence can be judged from the fact that they are yet to give a chance to big-hitters like Sri Lankan legend Sanath Jayasuriya and South African Jean-Paul Duminy. Chennai, meanwhile, have been boosted by the arrival of Australian imports Mike Hussey and Doug Bollinger. While Hussey has lent depth to their batting, Bollinger’s pace has added zing to their bowling. But to rope in Hussey in the side, skipper Mahendra Singh Dhoni faces the tough choice of having to drop either Matthew Hayden or Albie Morkel. Dhoni’s own form would be a cause of concern for him. He hasn't quite lived up to the expectations and was dismissed for a duck against Rajasthan in the last match. There is also a question mark over his fitness, which has only compunded Dhoni’s troubles. 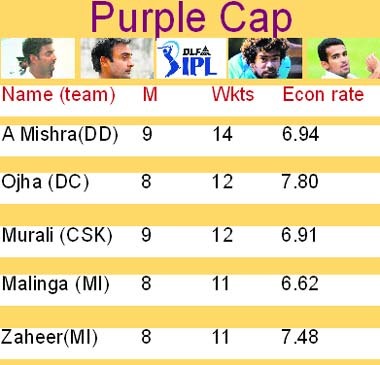 Given this, Mumbai have a clear edge as their top order batsmen have been doing well. Mahela Jayawardene (L) and Kumar Sangakkara. Kings XI Punjab batsman Mahela Jayawardene today said his side's eight-wicket victory over Kolkata Knight Riders in an Indian Premier League match here came at a right time to prove that there was no rift in the team contrary to speculation in a section of media. “Yes, there was a lot of things written about our side and the only way we could show unity in the team was with the bat and the ball on the field and we did that,” said Jayawardene, who knocked off an unbeaten 110 off 59 balls to guide his side to victory, at the post-match press conference. Jayawardene, who had been struggling in the tournament till today, said his unbeaten century knock was his best in the IPL. “Definitely, it’s the best knock in the IPL. I had couple of half-centuries but when you get a hundred, that too in a winning cause, it’s always special. There is no point getting big scores when you end up losing. We fought hard, showed a lot of character today, I am quite happy with it,” he said. “In a situation like that, everyone has to get something out of their hat. We lost a couple of very close games in this tournament. It was crucial for us to get it going. We have made a few mistakes that cost us matches. But we managed to finish the game off so we are quite happy,” Jayawardene said after Kings XI's second win in nine matches this season. On Chris Gayle’s 44-ball 88 which set up a big score for KKR, Jayawardene said the approach of different batsmen are never the same. “I was hitting some big sixes. Chris obviously is something special. You need guys of different calibre to come to the party at different times. Up the order, Sachin, Kallis and few others have shown that you have good innings in tough situations, while there are some others who approach the wrong way. “Cricket is something that keeps evolving. You need to keep challenging yourselves as cricketers, that's the most important thing. There are some tracks where 130-140 are defendable. You just need to assess the situation. People are challenging themselves that is the beauty of the game,” the former Sri Lankan captain said. Asked how he went about his innings today, Jayawardene said he kept assessing the situation and play accordingly. “I got into different roles at different times. Initially, it was crucial for us to get a good start and see through the first six overs. We had quite a few boundaries without taking any risk. It was very important for us to build partnerships. After Sangakkara came in, he took the pressure off me completely that helped me to settle down. I just had to bat through. When Yuvi came, I just had to be there at the other end. I knew that he will hit a few ones from the other end as he was getting back to his form. It's a team effort we just need to enjoy the this moment,” Jayawardene said. Prabhjot and Deepak, who were dropped from the list of 45 probables for the 19th Sultan Azlan Shah Cup International hockey tournament in Malaysia, apparently paid for their bad performance in the hockey World Cup held here last month. Even head coach Jose Brasa and officials were also critical of their poor show in the high profile tournament. “It is the job of the selectors and Hockey India to pick a squad, I can’t comment on that. But I feel that those who are playing good, should be given a chance and that might be the reason behind including several youngsters into the probables’ list,” Rajpal said. Defending champions India will face China in their campaign-opener of the 10-day tournament, commencing on May 6. Rajpal insisted that their morale is not down despite a listless performance in the World Cup and said the boys are determined to prove a point in the tournament. “We will certainly take positives from the World Cup. Our morale is not down and we are determined to bounce back in the coming tournaments, including Azlan Shah,” he said. Indian Weightlifting Federation has paid the international parent body second instalment fine of $75,000 out of $five lakhs imposed on it after six lifters flunked WADA tests last year and is fielding a 19-member team in Asian Youth and Junior Championships at Tashkent from April 7-16. International Weightlifting Federation had on March 31 accepted IWF’s proposal to pay the $five lakhs fine in four instalments and the national body had given first instalment of $50,000 in January before the South Asian Games in Bangladesh. The international body had set April 4 deadline for the second instalment, July 15 for the third instalment of $one lakh and August 15 for the fourth and final instalment of $2,75,000 if Indian lifters are to take part in international events including October 3-14 Commonwealth Games here. IWF Secretary Sahdev Yadav said the national body had paid the second instalment amount to the international federation before the April 4 deadline and that is why the youth and junior lifters are participating in the Asian event. “We have paid the second instalment fine before deadline. We want exposure of the young lifters at the international level,” he said. Youngsters Theo Walcott and Bojan Krkic could take centre stage when Arsenal visit Barcelona in their Champions League quarter-final second leg at the Nou Camp on Tuesday. Injuries and suspensions have forced Arsene Wenger and Pep Guardiola into changes and their ability to adapt will be tested to the full, with the European champions holding the edge having drawn 2-2 in last Wednesday's first leg. Arsenal are without captain Cesc Fabregas, who cracked a bone in his leg last week, while Barca have lost Swedish striker Zlatan Ibrahimovic, scorer of both their goals in London, to a calf injury. Guardiola turned to perennial substitute Bojan at home to Athletic Bilbao in La Liga on Saturday, when Ibrahimovic pulled out just before kickoff, and the 19-year-old scored twice in a4-1 win. "He always scores when he is played in his position (striker). I feel a little indebted to him because he always rises to the occasion," Guardiola said. "But he is young and has a lot to learn. We don't forget this." With Thierry Henry still struggling to convince Guardiola of his commitment to the cause, not helped by a largely anonymous second-half appearance at the Emirates Stadium, Bojan could start up front. Barca are without central defensive pairing Carles Puyol and Gerard Pique, who are both suspended. In their absence, Gabriel Milito and midfielder Yaya Toure could be drafted in at the back. Eric Abidal played his first game in over six weeks after injury on Saturday and should return at left back. Barca visit La Liga title rivals Real Madrid on Saturday for a top-of-the-table clash, but Guardiola was clear where his priorities lay. Continuing their winning spree on expected lines, hosts India thrashed Italy by 61-29 on the third day of the World Kabaddi Cup at Guru Gobind Singh Stadium here today. Right from the beginning India took control of the game and lead the match by 10 points while Italy were stranded at 3. Indian raider Sukhbir Singh Saravan, Sandeep Singh Surkhpuria and Hardawinder Singh Dulla Surkhpuria and stopper Sukha Bhandal gave a tough time to their Italian opponents. Among the Italian players Charanjit Singh Channa and Deep Garhibaksh gave a few scares to the Indian players but could not, ultimately, influence the course of the game. Meanwhile it was a close match between USA and Australia players, which US won by just four points. The US team won 47-43. Raider Rajiv Pandit from the US received a thumping response from the audience as he acted swiftly to some attacking moves during the game. In another match of the day Canada trounced Spain 66-28. Canadian players Kulwinder Singh Biharipuria, Kuljit Malsian, Terry Purewal, Kuldeep Badhni and Jagga Arowalia did not allow the opposition to score any points, which contributed to a dominating performance by the Spaniards. In tomorrow’s matches at Hoshiarpur, USA will play Iran, Pakistan will take on Spain while hosts India will battle it out with the Australians. Mass support is the fuel that drives the success of any sport. And while in India cricket is thew biggest ‘fuel guzzler’, a day when the rural folk throng the field to watch kabaddi matches, has to find special mention. Village sports clubs thronged the Guru Gobind Singh Stadium on the third day of the ongoing World Kabaddi Cup here this noon as the rustic youth gathered in large numbers to cheer the players. Such was the gusto among the youth that a majority of them came equipped with banners and placards in support of the game. Sandeep Singh from Guru Gobind Singh Sports Club, Lallian Kalan village near Mullanpur said, “We have been participating in village level kabaddi tournaments and the World Kabaddi Cup is a source of motivation for us. The youth in the villages is keen for Kabaddi and the government should make sure that this becomes a regular feature”. Meanwhile the ‘forced efforts’ of including urban youth as audience turned futile as youngsters left the stadium within an hour. This despite the fact that students and hostellers from Lovely Professional University, Phagwara, DAV Institute of Engineering and Technology, Jalandhar and a few local schools were strictly told watch the matches. “We have been forced to attend the matches. And it is compulsory for us to come here. We don’t have any option”, said a student. Commentary in kabaddi has come a long way and has evolved into a fine art that requires masterful oratory coupled with rustic idiom, background of the sport and strong points of both present and past players. This fact was evident at the ongoing World Kabaddi Cup where the commentators displayed their talent much to the delight of the audience who cheered at their racy dialogues and witticisms. A team of six commentators, including pioneer kabaddi commentators like Principal Sarwan Singh and Professor Makhan Singh, were widely appreciated by the crowd at the Guru Gobind Singh Stadium here this noon. Eminent cultural activists like Darshan Bari, Arvinder Kochhar, Gurpreet Singh Ber Kalan, Surjit Kakrali, Makhan Ali and popular comedian Bhagwant Mann are also part of this team. While talking to The Tribune, Principal Sarwan Singh, who has 40 years of experience in kabaddi commentary and 15 books on rural sports and players behind him, said this was for the first time in the history of the game that commentary was being done on the pattern of games like hockey and cricket. “Earlier, we saw commentators reporting live from the ground. It is for the first time that we are reporting on what’s happening on the ground from a commentary box for the audience in the stadium and those watching it on television,” added Sarwan Singh. Going into the background of the history of kabaddi commentary, he said people like Joginder Singh P.T.E and Dara Singh Grewal had popularised kabaddi commentary during games of Kila Raipur. He, however, claimed that Professor Makhan Singh, a postgraduate in Mathematics and kabaddi commentator for the last 28 years, had changed the paradigm of commentary and transformed it into an admixture of sports, literature and symbols of rural folklore. “Approximately 100 tournaments are being organised abroad every year. Till now, we have done commentary in approximately 1,500 Kabaddi tournaments”, added Sarwan Singh. He revealed that not much remuneration was paid to the commentators by organisers and most of them were doing this job merely to satisfy their hobby, and not as a profession. The world is oblivious of the grappling action of titan kabaddi players taking place in various parts of the state as even after two days of the Kabaddi world cup no official website has been launched by the organisers to fulfill the need of kabaddi frenzied fans sitting across the world. Besides, not even a mascot, which is a necessary feature for any world cup have been launched. Barring, few television news channels, and private news website, there is no source from where the latest information could be extracted. The foreign teams participating in the event are miffed with the organisers’ lackadaisical response as they are updating their families about their performance on phone. “Are we living in stone age? 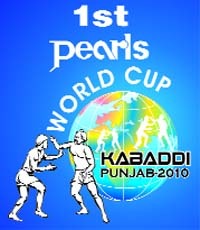 What kind of Kabaddi World Cup is this which has no website. My friends were asking me that they want to visit the website to check the standings but there was no mode of information. Ultimately they visited the websites of couple of newspapers to get the latest update,” said a Kabaddi player from Australia on the condition of anonymity. While crores of rupees have been spent on organising the mega event. “It costs merely Rs 7000 to float a website. The state government does not have that much funds. 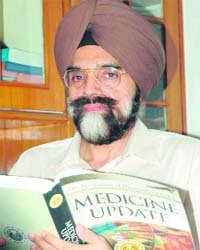 I am surprised,” said Sunny Gupta , a resident of Ludhiana. Stepping up the anti doping measure, the testing of blood samples of sportspersons has been introduced first time in India. Samples of blood of 12 players, taking part in the ongoing Kabaddi World Cup, were taken here today by a team of doctors. Confirming this, Dr Manmohan Singh, Chairman of the Medical and Anti Doping Commission of India said “ Today, we for the first time collected samples of blood of 12 Kabaddi players to further tighten the measures to eradicate the menace of drugs. This has also been done as preparatory step for the Commonwealth Games to be held later this year”. Earlier, only tests of urine samples were taken for dope testing in India. However, first time testing of blood samples has been introduced today, he asserted. Dr Manmohan Singh, who is also a member of the Anti Doping Mission of Olympic Council of Asia and Chairman of the Anti Doping Commission for Delhi Commonwealth Games, said there were certain performance enhancing substances which could only be detected after analysing the blood samples. There were reports that sportspersons have been using human growth hormones to raise their performance. Besides it, there were reports that sportspersons were resorting to blood transfusion. “Keeping in view these factors, the blood sampling and testing has been introduced in India”, asserted Dr Manmohan Singh. India has internationally recognised state of art lab to analyse the urine and blood samples. It is an established fact at the international level that players especially athletes, weightlifters, throwers take drugs to enhance their performance. Indian weightlifters were in news in this regard. Most powerful sprinter Ben Johnson was disgraced and disqualified for doping in Seoul Olympics. He was striped of the Olympic Gold Medal. Even Indian players taking part in the Kabaddi World Cup have been subjected to urine testing. Of the 46 players subjected to testing in two batches at the time of trials to selected the team, samples of 16 players were found positive. That means roughly 35 per cent of the players, who came to take part in trials, were doped. They were not allowed to take part in the tournament. Commending the anti doping measures taken in case of Kabaddi players, one of the most popular player of Kabaddi of his times Devi Dayal said, “ Rejection of the 16 players for doping is a good beginning. It would put a stop to use of drugs in Kabaddi tournaments in future”. “After testing urine one can find that whether the player concerned has been using steroids or stimulants or not,” said Dr Manmohan Singh. However, in case, the players stop taking it a few weeks before the competition these could not be detected during the testing of urine samples. “There are some steroids which , if one stops taking two months before the competition, could not be detected during the analyses of urine samples”, said Manmohan Singh.